The problem with learning guitar online is not with actually finding the lessons - there is no shortage of lessons out there, if you combine websites and youtube videos. What's lacking is a structured, logical learning path that will keep you focused and ensure you don't get "lost" in an overwhelming sea of information. That's why I created the guitar learning process below. Simply work from top to bottom to become a well rounded and creatively open minded guitar player with a wealth of skills and knowledge. It's from these broad and strong foundations that you'll naturally build on your strengths and gravitate towards your desired playing style. The first two stages are the most important. After them, you're free to choose and explore different paths, based on the guitarist you aspire to be, as you'll have the grounding you need to learn more independently. Though I've placed the Theory section at the bottom, it doesn't have to wait until you've completed the other sections. But it is more about bringing all the elements together and tying up loose ends. So see the Theory section as supplemental to the other sections. My approach is by no means perfect and I still have many gaps to fill in each section, plus a lot more organisation to do. But this site is constantly evolving so make sure you subscribe for updates. You can also see the FAQ further down the page for more help. Click the appropriate box in the process to be taken to the lessons and I'll see you on the other side! Why do I have to learn the fretboard so early on? Shouldn't this be part of "theory"? Well, ok I admit you don't have to, but a good knowledge of the fretboard early on will give you a huge head start when it comes to learning chord and scale based theory. You may not see the benefits of learning certain fretboard elements straight away (e.g. intervals), but I promise you - put the time in early on and you will run into significantly fewer road blocks along the way. I've received many emails from intermediate guitarists who have clearly neglected the fretboard and are struggling as a result. Don't let that be you! Should I learn rhythm or lead... or both? So as not to overwhelm you with the amount you have to learn at a given time, I've split rhythm and lead. This doesn't mean you choose one OR the other, it's just a way of encouraging you to prioritise based on the guitarist you aspire to be (or, just pick one and go with it). Many budding guitarists don't have the slightest bit of interest in lead/solo playing. They would rather focus on songwriting or "backing up the band". I often hear people say something like "I'm a chords guy". Fair enough. Others dream of taking the lead and playing those spine tingling solos. Choose one and stay focused. You can always do the other later. Why is "progressions" in both the rhythm and lead stages? There is some overlap here. 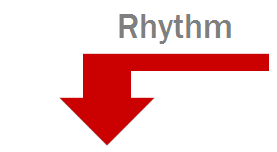 You can learn about progressions for playing in a rhythm context (i.e. 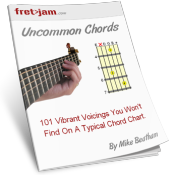 writing chord progressions, as the backbone of a song) and how to solo over progressions (i.e. the progression is already written and needs a melody). The progressions section covers both approaches. How should I split my practice time between the three elements in the rhythm/lead stage? I'd say a nice and even three-way split (uh... so that's 33.333 recurring % of your time each!). Start working through each of the three sections from top to bottom, taking the 1st lesson of each, then the second, then third etc. remembering to combine the skills you learn in each. As time goes on, it'll all start to piece together. It doesn't matter if you make more progress on one section than the other two - just give your time to all three as best as you can and you'll see progress. I want to learn blues/heavy metal/jazz/insert pre-conceived style here. Won't these lessons be too generic for me? I know it's a big ask, but please forget about style for now. We all have our favourite genres of music, but when you break them down to their core ingredients, stylistic differences are really just a difference in how we apply the fundamental skills and techniques taught in these lessons. I want to encourage you to open your mind to music in general, as a pure art form, not pigeon-hole yourself into one particular style/genre. Don't be a "blues/metal/country player"... be a musician, and style will then follow you. It only makes sense to specialise in the later stages of learning guitar. Enjoy the lessons, and remember, if you ever have any questions/problems along your journey, let me know.